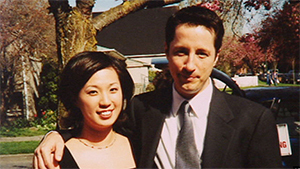 Last night CBC aired a story on my cousin, Mark Dawson, and his wife Yoo Choi. Yoo died a few months ago. She had a gambling addiction that she had struggled with in the past. Things got out of control and she committed suicide. Yoo was an incredible woman. One of the warmest, kindest, funniest people I’ve ever met. She ran a restaurant for a while, and described herself as a “foodie.” She cared about flavours and textures and the way they go together with a passion that baffled my Kraft-Dinner-cooking mind. She laughed a lot. She loved Mark with all her heart. Mark is sharing her story, hoping to help others. Please take a look.